Solo, it's a short word, 2 syllables, 3 letters. It commonly refers to an artist or performer but in the world of outdoor adventure it refers to a higher degree of risk, remoteness and mind games. I don't intend to go on solo backcountry bikepacking trips but I guess because I feel comfortable in that environment I don't change my intentions when I can't talk a close riding buddy into a mid week, mid winter, grade 5 overnight ride with a menacing storm on the horizon. Can you blame them? The truth is I really enjoy going solo. I ride at my own pace, stop when I feel I need to eat, spend more time listening to Mother Nature, absorb myself in my own thoughts and develop mentally to cope with set backs, fatigue and loneliness. Don't get me wrong I'm no recluse I enjoy social riding, I don't mind riding slower to encourage people that aren't as competent as I am and I like the challenge of trying to keep up with younger, fitter, more skilled riders. The anxiety of being solo heightens the rush, the increased risk makes me focus in the tricky stuff and the mind is free to wonder, at times reflecting and planning. So with a late start from the site of NZ's first hydro power scheme in Reefton which gave it the nickname the town of light, I headed off loaded up for a overnighter, into the jungle. I was travelling heavy with a medium weight sleeping bag, cook set and down jacket. I quickly warmed up on the steady gradient of the old mine road, last used in the 50's and now bush clad wide singletrack. An easy hour and a sweet descent to the Waitahu river had me at the Clematis swingbridge. Respect to DoC for this impressive structure. Thinking I would make good time up the river valley on the 4WD track I didn't bother carrying any water but the track was initially rocky as hell with plenty of boulder gardens and baby heads to negotiate then the bogs started deep and soft some of which required to get off, some had chicken lines around them. Montgomeries hut, cold, dark and wet firewood. I had contemplated, with good going to continue past the first hut and push on to kirwans hut which I knew to be a substantially better shelter and stocked with coal. I had given myself the deadline of 3 pm at Montys hut leaving me with about 3.5 hours of daylight. I made this deadline and the hut was damp and dark, the firewood dripping wet but anxiety set in and not knowing how long it would take to push and carry up the 800 vertical metres of technical trail lead me to make the decision to stay. With the decision made came the relief of not putting myself under pressure, knowing I'll be about to fight another battle with Mother Nature. I set about the tasks of getting comfortable for the night, collecting water and firewood. Taking the time to establish a fire that would burn wet wood and putting on dry warm clothes, the temperature would have been close to freezing point. With this done I made a hot drink and pigged out. I had a solid 11 hours sleep, another bonus of going solo. I woke in the dark and laid in my cozy cocoon planning what I needed to do to pack up and get underway at first light. I made freeze dried scrambled eggs with bacon, my favourite Absolute Wilderness breakfast and was on the bike at 8am. The first few kilometres followed the upper Waitahu and by the look of the map was not steep, I was hoping for riding conditions however it was not to be, very slippery roots and a trail hugging the river bank made for mostly pushing. After about an hour once again anxiety set in and I briefly stopped wondering if I should turn back, what was I doing up here in the middle of winter pushing a loaded bike with a massive hike a bike in front of me? It took me a few minutes to get my head straight and I was rewarded with the mental strength to persevere and the confidence that I needed to carry on. Soon the conditions improved and I was riding more than I was pushing. I arrived at the Lord Brassey battery, an ambitious gold mining operation from the early 20th century. Involving an aerial tramway for transporting the gold bearing quartz ore from where I was heading high on Kirwans hill to this battery to be crushed so the gold could be won. It's remarkable to think all this iron machinery was transported here by horse and dray a journey that is now at the least a solid days hiking through near impenetrable jungle. Nearing the end of 800 vertical metres of hike a bike. After the battery the track climbed steeply straight away and the hike a bike became 100% push and carry. I put my head down and powered on only stopping when my calves were screaming and once to eat. I reached Kirwans hut after about 3.5 hours from leaving montys hut. There was snow on the ground and as soon as I stopped I was wracked with shivers, I was wet through. Whilst having a quick lunch I donned layers of dry clothes and rugged up with my Tineli winter gloves feeling thankful I threw them in. At this point I couldn't feel my toes. Then it's time to use the credits I'd earned on the climbs, flowing technical single track but best of all on the bike! Every shade of green imaginable flashing past like some priceless surrealist painting, or maybe that was the delirium. Going from sparse sub alpine forest to lush dripping temperate rain forest. The diversity of the NZ backcountry still amazes even after a life spent in it. Lower down the signs of historic gold mining appear again and after the funkiest swingbridge that goes through a tunnel at the far end it's not far to the road end. 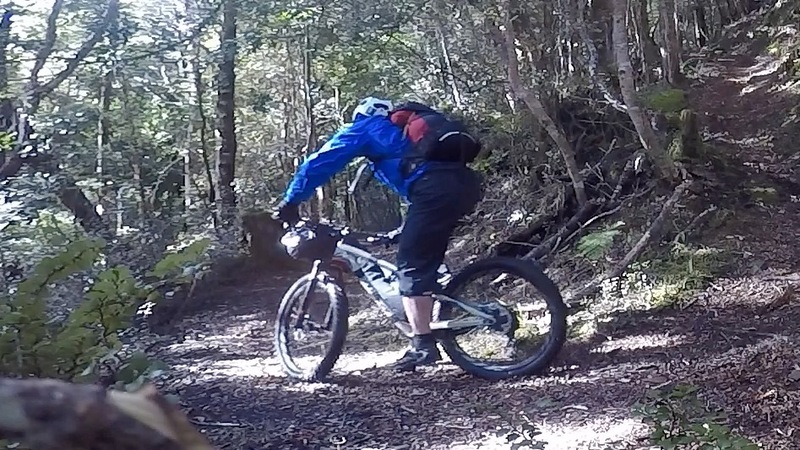 The sense of elation was rising sharply even with a 20 plus kilometre road ride back to Reefton. This feeling grows at the conclusion of a solo mission or any epic to take over the senses in a euphoric state. It's this hit that keeps me coming back for more solos. You should try it some time, golly you might even like it. Footnote; on any backcountry trip I do and especially solo trips I carry a Spot GPS tracker that allows me to send pre programmed messages, has a tracking function so family can follow my progress and has an SOS function similar to a personal locator beacon. I believe it's irresponsible to not carry a similar device anywhere remote outside of reliable mobile coverage.